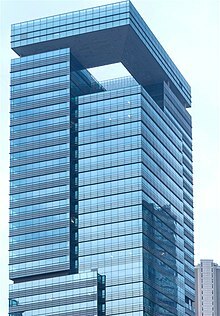 The New Development Bank (NDB), formerly referred to as the BRICS Development Bank, is a multilateral development bank established by the BRICS states (Brazil, Russia, India, China and South Africa). According to the Agreement on the NDB, "the Bank shall support public or private projects through loans, guarantees, equity participation and other financial instruments." Moreover, the NDB "shall cooperate with international organizations and other financial entities, and provide technical assistance for projects to be supported by the Bank." The initial authorized capital of the bank is $100 bln divided into 1 mln shares having a par value of $100,000 each. The initial subscribed capital of the NDB is $50 bln divided into paid-in shares ($10 bln) and callable shares ($40 bln). The initial subscribed capital of the bank was equally distributed among the founding members. The Agreement on the NDB specifies that the voting power of each member will be equal to the number of its subscribed shares in the capital stock of the bank. The bank is headquartered in Shanghai, China. The first regional office of the NDB is in Johannesburg, South Africa. On 15 July 2014, the first day of the 6th BRICS summit held in Fortaleza, Brazil, the BRICS states signed the Agreement on the New Development Bank, which makes provisions for the legal basis of the bank. In a separate agreement, a reserve currency pool worth $100 bln was set up by BRICS nations. Documents on cooperation between BRICS export credit agencies and an agreement of cooperation on innovation were also signed. On 11 May 2015, K. V. Kamath was appointed as the President of the bank. The 7th BRICS summit in July 2015 marked the entry into force of the Agreement on the New Development Bank. On 27 February 2016, the NDB signed Headquarters Agreement with the Government of the P.R.C. and the Memorandum of Understanding with Shanghai Municipal People’s Government concerning the arrangements in relation to Headquarters of the bank in Shanghai. According to the bank, most of the NDB policies and procedures for all functional areas were approved at the Board of Directors meeting in January 2016. On 20 July 2016, the first annual meeting of the NDB Board of Governors was held in Shanghai. The participants of the meeting discussed Bank's future work and development and gave a positive assessment to the bank's work. At the meeting, the first green financial bond issuance in Renminbi was highlighted as a milestone event for the NDB. In 2016, the NDB Board of Directors approved the first set of projects in all members of the bank. On 21 December 2016, the NDB signed its first loan agreement. The NDB received AA+ credit ratings from S&P Global Ratings (S&P) and Fitch Ratings (Fitch) in August 2018, which enables the bank to offer full suite of financial products to its public and private sector clients. As of March 2019, The bank announced to issue loans of up to $40 billion by 2022 in South Africa. Information about the composition of the NDB Board of Governors is available on the Bank's official website. The NDB President is elected on a rotational basis from one of the founding members, and there are four Vice Presidents from each of the other four founding members. K. V. Kamath, from India, is the first elected president of the NDB. The New Development Bank has an initial subscribed capital of USD 50 billion and an initial authorized capital of USD 100 billion. The initial subscribed capital is be equally distributed among the founding members. The payment of the amount initially subscribed by each founding member to the paid-in capital stock of the Bank will made in dollars in 7 installments. Each member cannot increase its share of capital without all other four members agreeing. The bank will allow new members to join but the BRICS capital share cannot fall below 55%. Promote infrastructure and sustainable development projects with a significant development impact in member countries. Establish an extensive network of global partnerships with other multilateral development institutions and national development banks. Build a balanced project portfolio giving a proper respect to their geographic location, financing requirements and other factors. The Agreement on the New Development Bank entered into force in July 2015, with the ratification of all five states that have signed it. The five founding members of the Bank include Brazil, Russia, India, China and South Africa. Bank's Articles of Agreement specify that all members of the United Nations could be members of the bank, however the share of the BRICS nations can never be less than 55% of voting power. Expanding the NDB's membership is considered by some experts to be crucial to its long-term development by helping boost the bank’s business growth. According to the Bank's General Strategy: 2017-2021, the NDB plans to expand membership gradually so as not to overly strain its operational and decision-making capacity. According to Articles of Agreement of the New Development Bank, the initial authorized capital of the bank is divided into 1 mln shares, having a par value of $100,000. Each founding member of the bank has initially subscribed 100,000 shares, in a total of $10 bln, of which 20,000 shares correspond to paid-in capital, in a total of $2 bln and 80,000 shares correspond to callable capital, in a total of $8 bln. The current distribution of shares between NDB member countries is presented in the following table. According to the Bank's General Strategy, sustainable infrastructure development is at the core of NDB’s operational strategy in 2017-2021, and the Bank will dedicate about two-thirds of financing commitments in its first five years to this area. The New Development Bank is planning to give a priority to projects aimed at developing renewable energy sources. As it was stated by the Bank, it wants to cooperate with other institutions in accelerating ‘green’ financing expansion and promoting environment protection. The NDB has expressed interest in funding projects that conform to high environmental standards, including those in the field of infrastructure, such as energy, railways and highways in the future. At the same time, according to K. V. Kamath, the NDB President, one of the key strategies of the bank will be financing profitable projects (bankable) with return on capital. The NDB wants "to fund projects that are creative and bring benefits to the local people and environment", said Vice President Zhu Xian. The leadership of the member countries task the bank with developing a strong pipeline of projects and responding in a fast and flexible manner to aspirations and interests of its members. As of 6 March 2019, the NDB Board of Directors approved 30 projects with loans aggregating over approx. USD 8 bln. The Bank has begun non-sovereign operations with loans approved in Brazil, South Africa, and Russia. In March 2016, the NDB announced that it will do a bond issue in China to raise funding domestically on the Chinese market. The bond issue is likely to happen in the second quarter of the year 2016, said the NDB Vice President Leslie Maasdorp. He added the bank is starting to finalize the exact size of this bond issue. On 18 July 2016 the NDB successfully issued its first green financial bond with issue size of RMB 3 billion, tenor of 5 years in China onshore interbank bond market. The bond's nominal interest rate is 3.07%. The bank became the first international financial institution that issued a green financial bond in the China onshore bond market. The proceeds of the bond will be used for infrastructure and sustainable development projects in the member countries. In February 2019, the bank successfully placed CNY 3 bln RMB-denominated bond in the China Interbank Bond Market, and it was priced at the lower end of announced pricing range. The Articles of Agreement of the bank say that the NDB was established to complement the existing efforts of multilateral and regional financial institutions for global growth and development. Moreover, the NDB is authorized by its founders to cooperate within its mandate with other international organizations, as well as national entities (public or private), in particular with international financial institutions and national development banks. The NDB President K.V.Kamath stresses that the bank regards other international financial institutions, including IMF and World Bank as partners, not rivals. In July 2016, the NDB signed with Asian Development Bank (ADB) a memorandum of understanding on strategic cooperation. The two institutions expressed willingness to work together through co-financing and knowledge exchanges in areas including sustainable development projects in renewable energy, energy efficiency, clean transportation, sustainable water management, and sewage treatment. Although some analysts hypothesize that Asian Infrastructure Investment Bank (AIIB) and the NDB would compete with one another, currently there is no evidence of competition among these institutions. Talking about the relations with AIIB, officials from the NDB's member-states point out the difference in the member-states of the NDB and AIIB as well as a potential to complement in working together to meet development and infrastructural needs. According to a representative of the Bank's management, the NDB and AIIB are sister institutions in many respects. These two banks have complementary mandates and different geographic focuses, with the NDB being more focused on BRICS countries. At the same time, there is a certain overlapping between mandates of the NDB and the AIIB, as both of them are aimed at developing infrastructure and pay a special attention to sustainable development. However, due to the fact that current financing and investment patterns are inadequate in meeting investment needs, there is "space for newcomers", he said. In February 2016, the president of the NDB dismissed concerns over overlapping of interests of China-backed Asian Infrastructure Investment Bank (AIIB) and the NDB. According to media reports, other multilateral development institutions, including the World Bank Group (WBG), have expressed an intention to work together with the NDB. In September 2016, NDB and World Bank Group signed a memorandum of understanding on cooperation and it was announced that the NDB and WBG’s cooperative efforts will focus primarily on infrastructure. In July 2014, Nobel Prize winning economist Joseph Stiglitz said the NDB marks a "fundamental change in global economic and political power." In his opinion, "The existing institutions just don’t have enough resources." Chinese Premier Li Keqiang called the opening of the NDB an "important step forward" in cooperation among BRICS countries. "This is great progress in financial cooperation among developing countries and emerging economies, as well as a helpful supplement to the global financial system," Li Keqiang said at a meeting with K. V. Kamath in Beijing in July, 2015. China Finance Minister Lou Jiwei said that the establishment of the NDB and the Beijing-led AIIB would encourage existing multilateral institutions to do better. At a news conference at the conclusion of the G20 meeting of finance ministers and central bank governors in Shanghai he added that the New Development Bank could help drive aggregate global demand. 8 July 2015, VTB CEO Andrey Kostin said that the NDB is "important because it’s a first institution created by the BRICS countries." "Actually we are talking about the institutionalization of the BRICS process, and that’s quite important I think. It’s a permanent working instrument which will be working every day and which will be in the heart of BRICS cooperation," he added. According to former Reserve Bank of India governor Raghuram Rajan, the NDB "Is a co-operative effort between all BRICS countries." "We have already reached contingency reserve agreement (CRA). This is second. Let’s see how it develops. Lots of hopes embedded in it for greater cooperation (among the) BRICS countries," he told reporters in February 2016. The logo of the New Development Bank borrows from the mathematical concept of a Mobius strip that symbolizes the idea of continuous transformation. Its nature is not to disrupt but drive change in the existing system from within. The logo consists of a triangle in motion at one end signifying balanced evolution. The other end, moving in the opposite direction, is a propeller that represents speed and dynamism. These two entities are held together by a wireframe, the skeletal basic of infrastructure. The logo is rendered in gradient of green that symbolizes sustainability. This constant motion symbolizes the values that the bank strives to live by – agility, innovation and continuous transformation. ^ a b c d e f g "Agreement on the New Development Bank – Fortaleza, July 15" (PDF). NDB Official Website. 15 July 2014. ^ Lewis, Jeffrey; Trevisani, Paulo. "Brics Agree to Base Development Bank in Shanghai". The Wall Street Journal. Retrieved 16 July 2014. ^ "Brics Bank now hiring in Johannesburg". Times LIVE. 7 March 2016. Retrieved 13 March 2016. ^ "BRICS Summit 2012: A long Journey to cover; Overview, Outcomes and Expectations". The World Reporter. 31 March 2012. Retrieved 31 March 2012. ^ Powell, Anita. "BRICS Leaders Optimistic About New Development Bank". Voice of America. Retrieved 27 March 2013. ^ "K V Kamath, non-executive chairman of ICICI, is now BRICS Bank head". Hindustan Times. New Delhi. 11 May 2015. Retrieved 16 May 2015. ^ "NDB Official Website - Newsroom - Press Releases -- The New Development Bank Signed Headquarters Agreement with the Government of the People's Republic of China". Retrieved 11 April 2016. ^ "NDB Successfully Issued First RMB-denominated Green Financial Bond". www.ndb.int. Retrieved 15 August 2016. ^ "NDB boards congratulate bank on its progress at the first annual meeting". www.ndb.int. Retrieved 15 August 2016. ^ "BRICS bank to allocate $100 mln for financing small-scale energy project in Karelia". www.ndb.int. Retrieved 15 August 2016. ^ "First Set of Loans Approved by the Board of Directors of the New Development Bank". www.ndb.int. Retrieved 15 August 2016. ^ "NDB BOARD OF DIRECTORS APPROVES LOANS FOR TWO PROJECTS IN CHINA AND INDIA DURING 7TH MEETING IN SHANGHAI". www.ndb.int. Retrieved 28 November 2016. ^ "NDB SIGNS FIRST LOAN AGREEMENT FOR FINANCING SHANGHAI LINGANG DISTRIBUTED SOLAR POWER PROJECT". www.ndb.int. Retrieved 30 December 2016. ^ "New Development Bank Receives AA+ Credit Rating from Fitch - New Development Bank". New Development Bank. Retrieved 13 August 2018. ^ "NDB receives AA+ rating from S&P, cementing its access to global financial markets - New Development Bank". New Development Bank. Retrieved 29 August 2018. ^ "BRICS bank to issue loans of up to $40 billion by 2022". RT International. Retrieved 8 March 2019. ^ "Leadership | New Development Bank". New Development Bank. Retrieved 13 August 2018. ^ "Agreement on the New Development Bank". University of Toronto. BRICS Information Centre. 15 July 2014. Retrieved 16 March 2016. ^ "BRICS Bank ready for launch - Russian Finance Minister". Russia & India Report. 10 July 2014. Retrieved 20 July 2014. ^ "BRICS New Development Bank hopes to expand by drawing other nations as members". Retrieved 24 August 2016. ^ a b "Strategy - New Development Bank". New Development Bank. Retrieved 13 August 2018. ^ a b "BRICS Bank to prioritize renewable energy projects — official". TASS. Retrieved 24 March 2016. ^ "New Development Bank defines its brand identity as an eco-friendly lender". The Hindu. 21 July 2016. ISSN 0971-751X. Retrieved 24 August 2016. 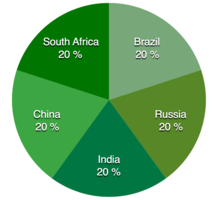 ^ "BRICS set to create new financial architecture". Russia & India Report. 22 June 2015. Retrieved 27 March 2016. ^ "World Bank & IMF 'corroded' - Jim Rogers to RT". RT News. 18 June 2015. Retrieved 27 March 2016. ^ F_200762. "BRICS New Development Bank aims to offer 2.5 bln USD of loans in 2017 - People's Daily Online". en.people.cn. Retrieved 28 November 2016. ^ "NDB should focus on creating strong project pipeline: Finance Minister Jaitley". 21 July 2016. Retrieved 24 August 2016. ^ "NDB's lending commitment in 2018 increased by 167%, bringing aggregate approval volume to USD 8 billion". New Development Bank. Retrieved 6 March 2019. ^ "NDB Successfully Issued First RMB-denominated Green Financial Bond". www.ndb.int. Retrieved 16 August 2016. ^ "NDB successfully placed 3 bln RMB bond in China Interbank Bond Market". New Development Bank. Retrieved 6 March 2019. ^ "Not here to compete with IMF, World Bank: NDB chief KV Kamath - The Economic Times". Retrieved 30 August 2016. ^ "President of the New Development Bank K. V. Kamath Met President of the Russian Federation Vladimir Putin". www.ndb.int. Retrieved 26 August 2016. ^ "No competition between BRICS bank and AIIB – Russian deputy foreign minister". Retrieved 25 August 2016. ^ "5 Minutes with Leslie Maasdorp of the New Development Bank – Insight". Insight. Retrieved 29 March 2016. ^ "First Brics bank loan to India likely for solar project: Kamath - Times of India". The Times of India. Retrieved 18 March 2016. ^ "China Headlines NDB president says to work with AIIB, hails bloc's significance - Xinhua". news.xinhuanet.com. Retrieved 30 March 2016. ^ "World Bank Group, New Development Bank Lay Groundwork for Cooperation - New Development Bank". New Development Bank. Retrieved 28 April 2017. ^ "Nobel Economist Joseph Stiglitz Hails New BRICS Bank Challenging U.S.-Dominated World Bank & IMF". Democracy Now!. Retrieved 16 March 2016. ^ "NDB president says to work with AIIB - China.org.cn". www.china.org.cn. Retrieved 30 March 2016. ^ "China finmin says establishment of NDB may help drive global demand". Reuters. 27 February 2016. Retrieved 18 March 2016. ^ "BRICS bank a 'worthwhile venture', off to good start: RBI guv Rajan". Hindustan Times. Retrieved 18 March 2016. ^ "DY Works bags integrated branding rights for BRICS bank". timesofindia-economictimes. Retrieved 4 April 2016. ^ "New Development Bank | DYWORKS". dyworks.in. Retrieved 4 April 2016. ^ "Our Identity | New Development Bank". www.ndb.int. Retrieved 4 April 2016.